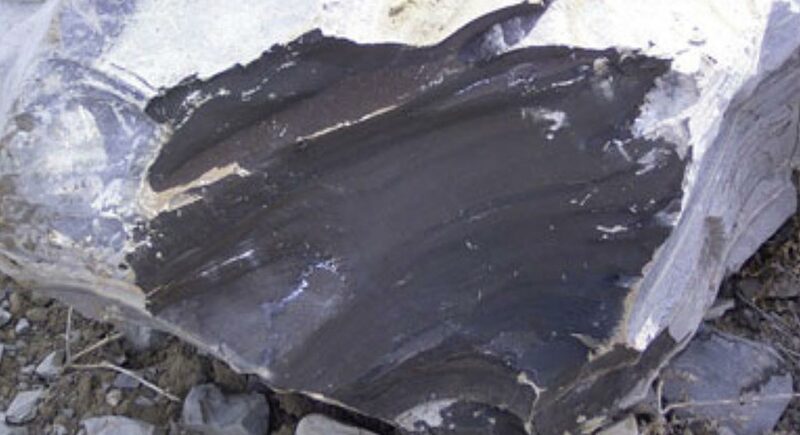 Oil shale is fine-grain sedimentary rock containing kerogen that can be used to produce the liquid hydrocarbon shale oil. Oil Shale refers to the sedimentary shale rock that contains oil-prone kerogen (partially converted fossil organic matter) which has not been submitted to enough pressure and temperature over millions of years to release oil Gallois, R.W., (1979) Oil Shale Resources in Great Britain, 2 vols, Institute of Geological Sciences, London. Unpublished report for the Department of Energy. Retrieved from: http://www.dorsetgeologistsassociation.com/RWG/oil-shales/1979_Oil_Shale_Vol_1.pdf Gallois, R.W., (1979) Oil Shale Resources in Great Britain, 2 vols, Institute of Geological Sciences, London. Unpublished report for the Department of Energy. Retrieved from: http://www.dorsetgeologistsassociation.com/RWG/oil-shales/1979_Oil_Shale_Vol_1.pdf Gallois, R.W., (1979) Oil Shale Resources in Great Britain, 2 vols, Institute of Geological Sciences, London. Unpublished report for the Department of Energy. Retrieved from: http://www.dorsetgeologistsassociation.com/RWG/oil-shales/1979_Oil_Shale_Vol_1.pdf Gallois, R.W., (1979) Oil Shale Resources in Great Britain, 2 vols, Institute of Geological Sciences, London. Unpublished report for the Department of Energy. Retrieved from: http://www.dorsetgeologistsassociation.com/RWG/oil-shales/1979_Oil_Shale_Vol_1.pdf Gallois, R.W., (1979) Oil Shale Resources in Great Britain, 2 vols, Institute of Geological Sciences, London. Unpublished report for the Department of Energy. Retrieved from: http://www.dorsetgeologistsassociation.com/RWG/oil-shales/1979_Oil_Shale_Vol_1.pdf Gallois, R.W., (1979) Oil Shale Resources in Great Britain, 2 vols, Institute of Geological Sciences, London. Unpublished report for the Department of Energy. Retrieved from: http://www.dorsetgeologistsassociation.com/RWG/oil-shales/1979_Oil_Shale_Vol_1.pdf Gallois, R.W., (1979) Oil Shale Resources in Great Britain, 2 vols, Institute of Geological Sciences, London. Unpublished report for the Department of Energy. Retrieved from: http://www.dorsetgeologistsassociation.com/RWG/oil-shales/1979_Oil_Shale_Vol_1.pdf . Through advanced processing methods, the oil shale can be converted into shale oil and other hydrocarbons. The kinds of hydrocarbons produced depends largely on the type of kerogen within the shale rock. For example, heating coal, which has kerogen mostly derived from plant matter, produces hydrocarbon gases. Oil shale kerogen, on the other hand, is largely derived from algae. After heating and refining, shale oil is chemically identical to conventional petroleum. Unlike conventional oil, shale oil cannot be recovered by drilling; it requires heating for oil to be released Vawter G., (2012), Status and importance of oil shale, 2012 AAPG Rocky Mountain Section Meeting Grand Junction, Colorado. Retrieved from: http://www.searchanddiscovery.com/documents/2012/80260vawter/ndx_vawter.pdf Vawter G., (2012), Status and importance of oil shale, 2012 AAPG Rocky Mountain Section Meeting Grand Junction, Colorado. Retrieved from: http://www.searchanddiscovery.com/documents/2012/80260vawter/ndx_vawter.pdf Vawter G., (2012), Status and importance of oil shale, 2012 AAPG Rocky Mountain Section Meeting Grand Junction, Colorado. Retrieved from: http://www.searchanddiscovery.com/documents/2012/80260vawter/ndx_vawter.pdf Vawter G., (2012), Status and importance of oil shale, 2012 AAPG Rocky Mountain Section Meeting Grand Junction, Colorado. Retrieved from: http://www.searchanddiscovery.com/documents/2012/80260vawter/ndx_vawter.pdf Vawter G., (2012), Status and importance of oil shale, 2012 AAPG Rocky Mountain Section Meeting Grand Junction, Colorado. Retrieved from: http://www.searchanddiscovery.com/documents/2012/80260vawter/ndx_vawter.pdf Vawter G., (2012), Status and importance of oil shale, 2012 AAPG Rocky Mountain Section Meeting Grand Junction, Colorado. Retrieved from: http://www.searchanddiscovery.com/documents/2012/80260vawter/ndx_vawter.pdf Vawter G., (2012), Status and importance of oil shale, 2012 AAPG Rocky Mountain Section Meeting Grand Junction, Colorado. Retrieved from: http://www.searchanddiscovery.com/documents/2012/80260vawter/ndx_vawter.pdf . There are two methods of recovering shale oil - ex-situ and in-situ processing. In ex-situ processing, shale oil is mined with conventional mining methods, like open pit, strip or underground mining. The shale is then transported to processing units that will retort, or heat up the shale in a process known as pyrolysis. Pyrolysis of shale rocks takes place in the absence of oxygen in temperatures between 900 and 1000 °F (450 to 500 °C) . At these high temperatures, the kerogen will decompose relatively quickly. Pyrolysis, in short, is a substitute to the natural mechanism that decomposes kerogen in earth over millions of years in high pressure and temperature conditions. In-situ processing allows for extraction of the shale oil by heating the shale directly underground on much longer timescales and lower temperatures Allix, P., Burnham, A., Fowler, T., Herron, M., Kleinberg, R., Symington, B. (2011), Coaxing Oil from Shale, Oilfield Review (Schlumberger), Winter 2010/2011: 22, no. 4. Retrieved from: http://www.slb.com/~/media/Files/resources/oilfield_review/ors10/win10/coaxing.ashx Allix, P., Burnham, A., Fowler, T., Herron, M., Kleinberg, R., Symington, B. (2011), Coaxing Oil from Shale, Oilfield Review (Schlumberger), Winter 2010/2011: 22, no. 4. Retrieved from: http://www.slb.com/~/media/Files/resources/oilfield_review/ors10/win10/coaxing.ashx  Bartis, J. T., LaTourrette, T., Dixon, L., Peterson, D.J., Cecchine, G., (2005), Oil Shale Development in the United States. Prospects and Policy Issues. Prepared for the National Energy Technology Laboratory of the U.S. Department of Energy. Retrieved from: http://www.rand.org/content/dam/rand/pubs/monographs/2005/RAND_MG414.pdf Bartis, J. T., LaTourrette, T., Dixon, L., Peterson, D.J., Cecchine, G., (2005), Oil Shale Development in the United States. Prospects and Policy Issues. Prepared for the National Energy Technology Laboratory of the U.S. Department of Energy. Retrieved from: http://www.rand.org/content/dam/rand/pubs/monographs/2005/RAND_MG414.pdf Bartis, J. T., LaTourrette, T., Dixon, L., Peterson, D.J., Cecchine, G., (2005), Oil Shale Development in the United States. Prospects and Policy Issues. Prepared for the National Energy Technology Laboratory of the U.S. Department of Energy. Retrieved from: http://www.rand.org/content/dam/rand/pubs/monographs/2005/RAND_MG414.pdf Bartis, J. T., LaTourrette, T., Dixon, L., Peterson, D.J., Cecchine, G., (2005), Oil Shale Development in the United States. Prospects and Policy Issues. Prepared for the National Energy Technology Laboratory of the U.S. Department of Energy. Retrieved from: http://www.rand.org/content/dam/rand/pubs/monographs/2005/RAND_MG414.pdf Bartis, J. T., LaTourrette, T., Dixon, L., Peterson, D.J., Cecchine, G., (2005), Oil Shale Development in the United States. Prospects and Policy Issues. Prepared for the National Energy Technology Laboratory of the U.S. Department of Energy. Retrieved from: http://www.rand.org/content/dam/rand/pubs/monographs/2005/RAND_MG414.pdf Bartis, J. T., LaTourrette, T., Dixon, L., Peterson, D.J., Cecchine, G., (2005), Oil Shale Development in the United States. Prospects and Policy Issues. Prepared for the National Energy Technology Laboratory of the U.S. Department of Energy. Retrieved from: http://www.rand.org/content/dam/rand/pubs/monographs/2005/RAND_MG414.pdf Bartis, J. T., LaTourrette, T., Dixon, L., Peterson, D.J., Cecchine, G., (2005), Oil Shale Development in the United States. Prospects and Policy Issues. Prepared for the National Energy Technology Laboratory of the U.S. Department of Energy. Retrieved from: http://www.rand.org/content/dam/rand/pubs/monographs/2005/RAND_MG414.pdf . There are various methods with which in-situ processing and extraction can be achieved. However, all of them are still largely in their experimental stages and have yet to achieve commercial levels of production NOSA (National Oil Shale Association), (2013), Additional Information: Processing Oil Shale. Retrieved from: http://oilshaleassoc.org/?p=69 NOSA (National Oil Shale Association), (2013), Additional Information: Processing Oil Shale. Retrieved from: http://oilshaleassoc.org/?p=69 NOSA (National Oil Shale Association), (2013), Additional Information: Processing Oil Shale. Retrieved from: http://oilshaleassoc.org/?p=69 NOSA (National Oil Shale Association), (2013), Additional Information: Processing Oil Shale. Retrieved from: http://oilshaleassoc.org/?p=69 NOSA (National Oil Shale Association), (2013), Additional Information: Processing Oil Shale. Retrieved from: http://oilshaleassoc.org/?p=69 NOSA (National Oil Shale Association), (2013), Additional Information: Processing Oil Shale. Retrieved from: http://oilshaleassoc.org/?p=69 NOSA (National Oil Shale Association), (2013), Additional Information: Processing Oil Shale. Retrieved from: http://oilshaleassoc.org/?p=69 . Shale oil is a hugely untapped resource that has been mined and processed since the 1800s. Relative to conventional oil, however, the production quantities have been low. According to the International Energy Agency, there are about 1 trillion barrels of economically recoverable shale oil resources, compared to 1.3 trilion of recoverable conventional oil reserves EIA (International Energy Agency) (2010), World Energy Outlook 2010. Recovered from: http://www.worldenergyoutlook.org/media/weo2010.pdf . However, with ex-situ technology being the only economically viable method of recovering shale oil, even with government subsidies, shale oil is not expected to account for more than 1 million barrels of oil per day (mb/d) by the year 2035 (with current oil production at 93 mb/d) EIA (International Energy Agency) (2010), World Energy Outlook 2010. Recovered from: http://www.worldenergyoutlook.org/media/weo2010.pdf EIA (International Energy Agency) (2010), World Energy Outlook 2010. Recovered from: http://www.worldenergyoutlook.org/media/weo2010.pdf EIA (International Energy Agency) (2010), World Energy Outlook 2010. Recovered from: http://www.worldenergyoutlook.org/media/weo2010.pdf EIA (International Energy Agency) (2010), World Energy Outlook 2010. Recovered from: http://www.worldenergyoutlook.org/media/weo2010.pdf EIA (International Energy Agency) (2010), World Energy Outlook 2010. Recovered from: http://www.worldenergyoutlook.org/media/weo2010.pdf . In a 2005 report by the European Commission European Commission (2005), Non-Nuclear Energy Research in Europe – A comparative study. Country Reports A – I, Volume 2. Retrieved from: http://ec.europa.eu/research/energy/pdf/synergy_vol2_en.pdf European Commission (2005), Non-Nuclear Energy Research in Europe – A comparative study. Country Reports A – I, Volume 2. Retrieved from: http://ec.europa.eu/research/energy/pdf/synergy_vol2_en.pdf European Commission (2005), Non-Nuclear Energy Research in Europe – A comparative study. Country Reports A – I, Volume 2. Retrieved from: http://ec.europa.eu/research/energy/pdf/synergy_vol2_en.pdf European Commission (2005), Non-Nuclear Energy Research in Europe – A comparative study. Country Reports A – I, Volume 2. Retrieved from: http://ec.europa.eu/research/energy/pdf/synergy_vol2_en.pdf European Commission (2005), Non-Nuclear Energy Research in Europe – A comparative study. Country Reports A – I, Volume 2. Retrieved from: http://ec.europa.eu/research/energy/pdf/synergy_vol2_en.pdf , Estonia accounted for 70% of world shale oil production. As with most unconventional resources, there are environmental impacts associated with shale oil excavation, especially with the ex-situ method where surface mining can damage the land. Taking into account all of the energy going into excavation, the emission levels of direct combustion of shale oil is on par with the lowest grade of coal. Furthermore, many experimental in-situ methods require large amounts of water (with solvents) to hydraulically fracture the shale rock formation. This, as well as the spent (retorted) shale, poses viable risks of contaminating the ground water supplies EASAC (European Academies Science Advisory Council), (2007), A study on the EU oil shale industry – viewed in the light of the Estonian experience, European Academies Science Advisory Council. p. 23–30. Retrieved from: http://www.easac.eu/fileadmin/PDF_s/reports_statements/Study.pdf EASAC (European Academies Science Advisory Council), (2007), A study on the EU oil shale industry – viewed in the light of the Estonian experience, European Academies Science Advisory Council. p. 23–30. Retrieved from: http://www.easac.eu/fileadmin/PDF_s/reports_statements/Study.pdf EASAC (European Academies Science Advisory Council), (2007), A study on the EU oil shale industry – viewed in the light of the Estonian experience, European Academies Science Advisory Council. p. 23–30. Retrieved from: http://www.easac.eu/fileadmin/PDF_s/reports_statements/Study.pdf EASAC (European Academies Science Advisory Council), (2007), A study on the EU oil shale industry – viewed in the light of the Estonian experience, European Academies Science Advisory Council. p. 23–30. Retrieved from: http://www.easac.eu/fileadmin/PDF_s/reports_statements/Study.pdf EASAC (European Academies Science Advisory Council), (2007), A study on the EU oil shale industry – viewed in the light of the Estonian experience, European Academies Science Advisory Council. p. 23–30. Retrieved from: http://www.easac.eu/fileadmin/PDF_s/reports_statements/Study.pdf . However, the in-situ method could also serve as a potential CO2 sequestration method that could greatly lower its green house gas emission impact Allix, P., Burnham, A., Fowler, T., Herron, M., Kleinberg, R., Symington, B. (2011), Coaxing Oil from Shale, Oilfield Review (Schlumberger), Winter 2010/2011: 22, no. 4. Retrieved from: http://www.slb.com/~/media/Files/resources/oilfield_review/ors10/win10/coaxing.ashx Allix, P., Burnham, A., Fowler, T., Herron, M., Kleinberg, R., Symington, B. (2011), Coaxing Oil from Shale, Oilfield Review (Schlumberger), Winter 2010/2011: 22, no. 4. Retrieved from: http://www.slb.com/~/media/Files/resources/oilfield_review/ors10/win10/coaxing.ashx Allix, P., Burnham, A., Fowler, T., Herron, M., Kleinberg, R., Symington, B. (2011), Coaxing Oil from Shale, Oilfield Review (Schlumberger), Winter 2010/2011: 22, no. 4. Retrieved from: http://www.slb.com/~/media/Files/resources/oilfield_review/ors10/win10/coaxing.ashx Allix, P., Burnham, A., Fowler, T., Herron, M., Kleinberg, R., Symington, B. (2011), Coaxing Oil from Shale, Oilfield Review (Schlumberger), Winter 2010/2011: 22, no. 4. Retrieved from: http://www.slb.com/~/media/Files/resources/oilfield_review/ors10/win10/coaxing.ashx Allix, P., Burnham, A., Fowler, T., Herron, M., Kleinberg, R., Symington, B. (2011), Coaxing Oil from Shale, Oilfield Review (Schlumberger), Winter 2010/2011: 22, no. 4. Retrieved from: http://www.slb.com/~/media/Files/resources/oilfield_review/ors10/win10/coaxing.ashx .